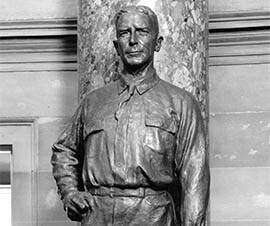 PHOENIX – With great fanfare, state officials in March unveiled an 8-foot-tall bronze statue of the late U.S. Senator Barry M. Goldwater that will represent Arizona at the National Statuary Hall in Washington. Those tasked with raising money to create and ship the statue say they need to raise another $65,000 or so not only to get it to Washington but to bring home the statue it will replace. And the state lawmaker who shepherded the legislation calling for Goldwater’s likeness to replace one of mining executive John Campbell Greenway said officials at the U.S. Capitol have been slow scheduling a date for the statue’s unveiling. “We haven’t ruled out garage sales and swap meets either – any way we can to get him there,” Hale said. “The real reason it is taking so long is waiting for the Architect of the Capitol and House Speaker Boehner to give us a date,” Driggs said. “Once we get a date, it will facilitate the last push,” he added. Laura Condeluci, a spokeswoman for the Architect of the Capitol, said via email Thursday that she couldn’t respond immediately to a request for comment on Driggs’ concerns. In 2008, Driggs sponsored legislation to add Goldwater to the National Statuary Hall collection, where each state is represented by two statues. Arizona’s other statue is of Father Eusebio F. Kino, the Jesuit priest who established missions during the 17th century. He said he and others consider Goldwater a better representation of Arizona’s modern history than Greenway, whose statue has stood in the hall since 1930. Artist Deborah Copenhaver Fellows, the creator of the Goldwater statue, said she doesn’t think the average Arizonan understands this. “I cannot tell you the number of people who have come into my studio in the last 24 months who have said, ‘I met him. I remember him. He was wonderful. He is what we need now.’ I mean he is just like a hero in Arizona,” she said. 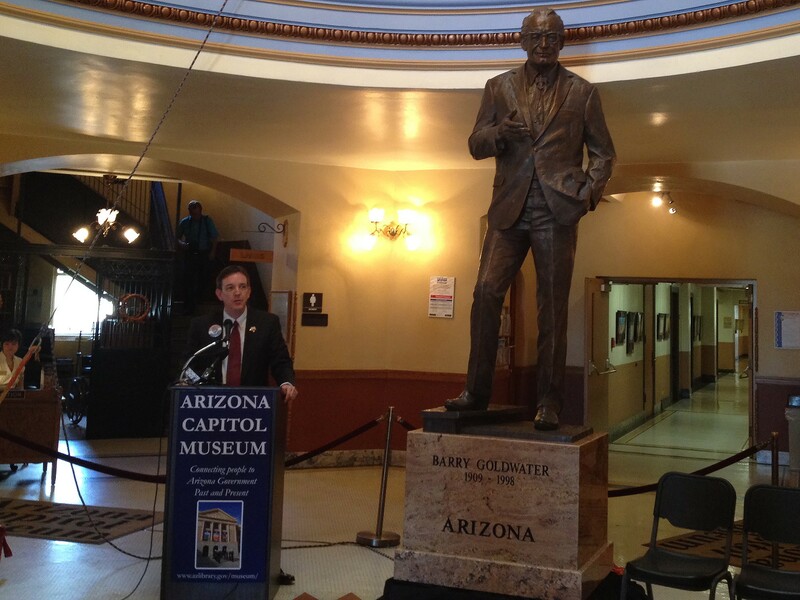 “I can always look back on it with pride and know that a creative idea I had was successful and that Barry Goldwater – Mr. Arizona – has taken his rightful place in Statuary Hall,” he said. At its unveiling in March, Secretary of State Ken Bennett discusses a new statue honoring late U.S. Sen. Barry M. Goldwater that will represent Arizona at the U.S. Capitol. 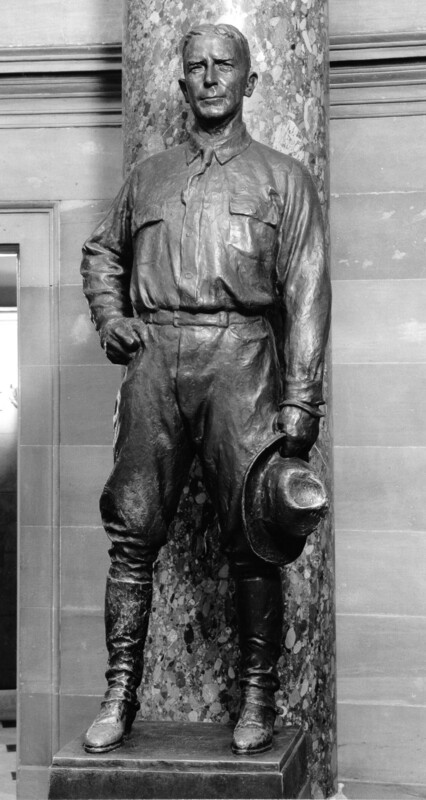 This bronze statue of mining, steel and railroad magnate John Greenway stands in the U.S. Capitol’s National Statuary Hall, which honors individuals chosen by states.